"Celebrating 71 years entertaining the County of Bridgend"
For more pictures from the shows, click on the big picture below! 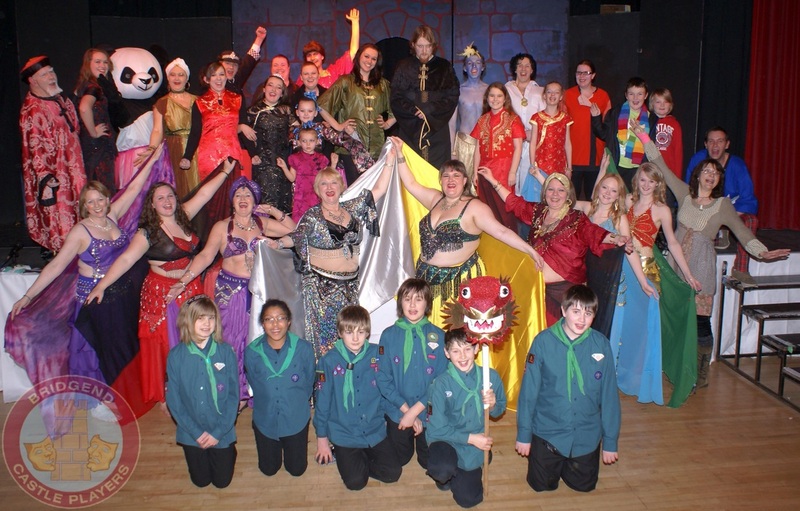 Our pantomime for 2012 was "Aladdin" written and directed by Steve Crawford. Once again Bridgend Castle Players bring you everything a panto needs and more including a giant dragon, some famous belly dancers and a show that is so funny, you could end up with a visit from the doctor if you're not too careful! This production was made possible with the support of the following businesses, organisations and individuals. "The Desert Divas" Photographs provided by "Timegrabber"
Bridgend Castle Players and it doesn't cost as much as you would think. Prices Start at just £10 per year. In exchange for your generous donations, you will receive a quarterly update, your name in the programme of all productions for the year plus a complimentary ticket to attend the major shows of the year. If you would like more information, please click here to fill in the form, select "I want to be a patron" from the options and our patron secretary will get in touch with you. Click HERE to find out if we're live!